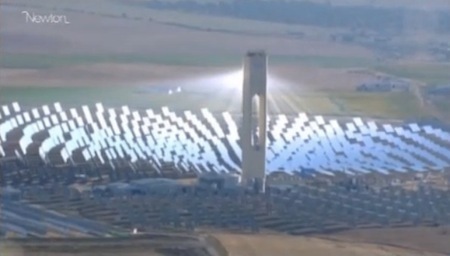 Check out the spectacular solar tower technology Spain is now using for solar power. It’s the first commercial solar tower plant of its type, concentrating solar power (CSP), in the world. No doubt it has contributed to Spain producing a significant 35% of power from renewable sources in 2010. Spain is already well on its way to producing the majority of its energy from renewable sources. One of the benefits of this kind of power plant is that once it’s up and running, there are no fuel costs. Another benefit is that it can produce power at night when the sun isn’t shining. Excess heat from the day is stored in containers of molten salt. The power produced here is enough for about 200,000 homes. As the video says, this kind of groundbreaking solar technology project has “become a model for the planet”. Indeed. There are many areas in the world where these could be deployed. Why are we not getting it done faster?! Hat tip to Nick Evershed for pointing to this video. Good that you mentioned molten salt, this is what make solar a base load technology. Think this is where the lowest cost solar energy will come from. Won’t be competitive with cheap fossil fuels, but this is where we need to be. Big desert plants and international DC transmission grids. I think solar plants such as this might be become competitive with cheap fossil fuels, if fossils become more expensive. It seems like burning coal might become less economically viable in the future, along with not be environmentally viable. As they say in the video, one of the advantages of this kind of tech is that no fuel is needed after it has been established. The Message is clear Clean Energy Solar. Solar Energy has the Ability and is helping generate JOBS at a time many Nations has seen its worst economy in many years. Archimedes Showed this to the World over 2,250 years ago. The Wicked have tried to keep it from the history books for a long time. GOD Bless You for showing this to the World. Previous post: Can the sea solve China’s water crisis?